Rolf Potts explores why and how we collect souvenirs, what they have represented to us through the ages, and how we use them to narrate our lives. The present-day practice of collecting souvenirs/keepsakes, though popular, is rather looked down upon. Jean Baudrillard, cultural theorist, dismissed the entire business as a museum of junk proliferating everywhere and declared: "...kitsch is the equivalent to the cliché in discourse." In Diane Johnson's The New Yorker story, Great Barrier Reef, the narrator broods about the necessity of souvenirs and her own complicity with the souvenir industry. Annoyed with her fellow cruise travelers for only wanting to rummage in souvenir shops at each island stop, she rants about them being "ugly consumers" and how the people who create souvenirs can only have contempt for other people. That said, most of us tend to hang on to certain objects beyond their obvious values of utility, aesthetics, or entertainment. This is because souvenirs do more to signify our emotional memories, evolving narrative selves, and idealized self-identities than we can often realize. Each book starts from a specific inspiration: a historical event, a literary passage, a personal narrative, a technological innovation-and from that starting point explores the object of the title, gleaning a singular lesson or multiple lessons along the way. Featuring contributions from writers, artists, scholars, journalists, and others, the emphasis throughout is lucid writing, imagination, and brevity. Object Lessons paints a picture of the world around us, and tells the story of how we got here, one object at a time. From golf balls to the concept of silence, the range of objects being addressed goes from the mundane to the ephemeral. However, by peeling back the layers of history, science, politics, mythology, etc., behind each souvenir, these writings transform their banal everydayness into something magical. The articles compel us readers to also then contemplate and rediscover our own relationships with these objects (or other similar ones). This volume's author, Rolf Potts, is an award-winning travel writer and journalist. His writing has earned him wide recognition and comparisons with Paul Theroux, Jack Kerouac, Jan Morris, et al. His essay style has been described as merging nuanced literariness with a gonzo adventure flair. And his independent travel style could best be summarized as vagabonding around the world on a shoestring budget. 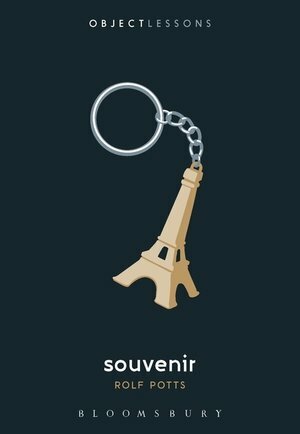 In French, " se souvenir de quelque chose" means "to remember something". Potts takes us on a meditative sojourn across several millennia as he describes the evolution of travel from the early nomadic migrations to religious pilgrimages to modern tourism. Along the way, he analyzes how this evolution has changed the way travelers and tourists have identified with and collected souvenirs to preserve memories and pass on stories. Further, he describes how these psychological shifts have, in turn, transformed the souvenir from a rare/magical treasure to a mass-produced commodity. With a natural fluency, Potts also weaves in personal stories and epiphanic moments related to his own souvenir hunting and gathering during his many, varied quests around the globe. Through it all, he shows us how, far from the superficial and mindless consumerism it may seem, the souvenir ritual is closely connected to our core sense of self even as the souvenir itself is no longer as fully rooted in its actual place. Some of his revelations about souvenir habits during troubling times — for example, how people stole parts from dead bodies after lynchings in 19th and early-20th century America and on battle-fields — are horrifying. No doubt, there are plenty more grisly souvenir traditions in other earlier societies that we do not know of due to a lack of records. Methodically, Potts explores every aspect of the souvenir ritual: how people go on specific excursions for them during their travels; how they search/pick out exactly what they consider necessary; how they buy/acquire these souvenirs; how they transport them back home; how they store and/or display them; how they share the origin stories with others; how those stories, in turn, influence other (potential) travelers; and, eventually, how (and indeed, why) souvenirs are replaced or disposed of. These individual phases of the universal life-cycle of a souvenir are often not driven so much by the thing itself or its "authenticity" as they are by our rather idealized visions of the places we visit and the selfhoods we aspire to. Also, just as our souvenirs are influenced by our media-driven fantasies or mythologies of the places we visit, so too our collective desires, over time, influence the cultural artifacts being created by the people of those places. Overall, this is Pott's underlying thesis: souvenir-collecting is mostly about the stories we tell ourselves and others about the places we visit and the identities we aspire to. We may have some amazing adventures on a trip. However, unless we are able to capture the essence of our travels in symbolic artifacts, our experience does not feel complete to us. Given the above, it might have been worth exploring more how, beyond personal stories, souvenirs from far-off places also shape the creative imaginations of our societies. Potts touches on this briefly with Keats' poems about a Grecian urn and a lock of Milton's hair. But surely many more artists have created works of art based on various tchotchkes and talismans picked up during their travels. Probably, an entirely separate book is necessary to delve into the stories behind such evolutions. Of course, in our times, symbolic artifacts from our travels largely take the form of photographs shared on social media. So it's surprising to find that, for someone active enough on social media himself, Potts has not examined how the physical souvenir seems to be increasingly replaced, at least among millennials, by Facebook and Instagram photos. This might be because he had defined his focus for the book as "physical objects collected for personal reasons" and a photograph is not exactly that. In fact, Potts rightly points out that "...souvenir memories are more associational, less visually specific, more unique to the object's owner, and more likely to transform over time." Still, it remains to be seen whether/how this change will affect the strong global souvenir industry that Potts had reviewed in the writing of this book. The epigraph at the beginning of this book is a quote from the autobiography of another travel writer and essayist, Barbara Grizzuti Harrison, about how the human need to collect, codify, classify, catalogue, and thus control our possessions and memories is about wanting to bring order to a world that is too full of things. Postscript: If you are among those who, rather than hanging onto memento mori, prefer to purge the past and liberate yourself, this beautiful essay on The Museum of Broken Relationships in Zagreb, by Leslie Jamison, may be of interest.